It began in Wagga Wagga in New South Wales and what an odyssey it has been for Nathan Hines. From Australia to Edinburgh, from Edinburgh to Perpignan, from Perpignan to Leinster and from Leinster to the city of Clermont and three years spent in one of France's most illustrious teams, ASM, funded by the Michelin men. In the next couple of months, Hines, his wife, Leann, their five-year-old son, Josh, and their 11-month twins, Lachlan and Chloe, will embark on the next leg of the journey - from Clermont to Manchester, where he will play for Sale for two years. There he will reunite with Chris Cusiter, his former Scotland team-mate and a former neighbour when they both played for Perpignan. Those were care-free days. They used to pop around each other's apartments and play Guitar Hero. Innocent times. When that contract ends Hines will be 39 and yet nobody who knows him would dare predict that he will call it a day at that point. With Hines, you can never quite tell. 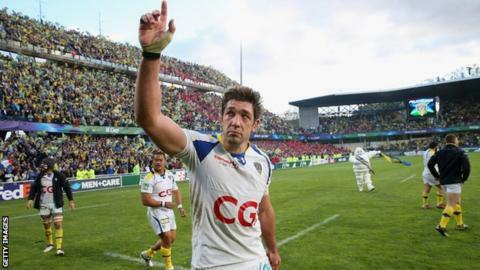 On Saturday, he played for Clermont Auvergne in the semi-final of the Heineken Cup. It was the fifth year in a row that he had played in the penultimate round of European rugby's pre-eminent competition. Saracens' eye-opening victory means he will not add to his solitary winners' medal, with Leinster from that unforgettable, back-from-the-dead final against Northampton in 2011. But trawl through the record books and it is only the Munster players of 2000-2004 who have previously done what Hines did. Nobody from Toulouse has done it. Nobody from Leicester. Nobody from Leinster. Nobody from any of these storied sides has ever played in five straight semis, but that does not even cover it. What Hines is doing should not really be possible in this brutal age of professional rugby. In this unforgiving world, where players retire early with a myriad different injuries, he sails on serenely at the age of 37. He is not a bit-part player at Clermont. He's not used sparingly off the bench by his coach, and soon-to-be-Scotland coach, Vern Cotter. He is in the vanguard most weeks. He has had more minutes on the field this season than any of the other lock forwards at the club. Hines is a go-to man. A player of vast physicality and immeasurable nuisance value and yet one who possesses such subtle hands. A player who makes good decisions and who leads. Brian O'Driscoll, his former team-mate at Leinster, once eulogised Hines for his cleverness and his skill and the attrition he brings to his work. Reminding him on Thursday of what O'Driscoll said about him, Hines displayed another of his characteristics - a reluctance to go along with the welter of praise. "Drico's a liar," he smiled. "The only reason he said nice things about me is because I've got the dirt on him. The reason I've stayed healthy is because I never tackle anybody. You haven't been watching me closely, have you? "I've been lucky to be in the right team at the right time. You can't do it by yourself. I've had good luck on my side. Yeah, you've got to be alright at your job, but I wouldn't say I'm the most gifted rugby player in the world. I've looked after myself. I eat well. I rest well. "I'm too old now to go out drinking in nightclubs. At half six I have my breakfast before the kids get up so imagine trying to do that having had a heap of beers the night before? You fall behind on your sleep so you're not training properly and if you're not training properly you can't play well." The semi-final with Saracens was always going to be an enormous occasion, but it was even more significant given what happened to Clermont in last year's final against Toulon, a match they controlled until getting sucker-punched in the closing stages. The French press have not allowed them to forget it. The "bottlers" tag has been summoned up a lot since then and will be against after Saturday's thumping defeat. "Yeah, it's been shoved in our face," said Hines. "But what can you do? You try not to look backwards. We don't want to go backwards, we want to go forwards." The man who has driven them on for all these years is Cotter, who built Clermont up and was desperate to make them champions of Europe before leaving for Scotland. "Vern took the club and shaped it the way he wanted it," explained Hines. "He's a tough man, there's no getting away from it. You don't make an omelette without breaking some eggs and in his early days at ASM he broke some eggs. People who were not really happy about changing their way of doing things didn't stay around for long. "That's what I'd say about Vern going to coach Scotland. He knows what he wants. He's honest and direct and doesn't beat about the bush. He knows the quickest way from A to B. He's very clear. It says a lot about him that he's backing himself to turn Scotland around. He's not going there because it's going to be easy." Neither is maintaining the standards Hines has set, but he is defying rugby's convention and is getting better with age. Thirty-seven years old and the adventures are still coming thick and fast.